Systems Officer reminds me a bit of Grandaddy. Of Grandaddy I have to say this: I have seen Grandaddy once, opening for Elliott Smith, and Jason Lytle (formerly of Grandaddy) once, opening for Neko Case. It is probably unfair to hold Grandaddy and Jason Lytle up to the same level of adoration that I have for the other two artists (considering I would have hurdled myself into a closet full of menstruating hornets to see either Smith or Case). It’s not that I don’t like Grandaddy (or by association Lytle), it’s just that I would rather listen to something else. I feel the same way about Systems Officer. 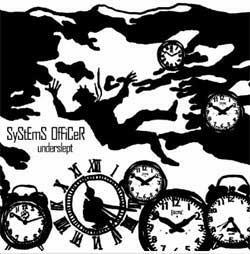 Sure, there are moments that Systems Officer reminds me of Sunny Day Real Estate (my fourteen-year-old self just squealed and started humming “Seven”) and other times they sound a bit like Peter, Bjorn, and John; who I also really enjoy. But I just can’t get past it—they sound too much like Grandaddy. I don’t love them, and I don’t hate them. I would just rather listen to something else. It’s not that they’re bad, either. “Shape Shifter” weaves some interesting interplay of keyboard, guitar, and bass and is one song that I could get stuck in my head and feel like I wasn’t waiting desperately to hear “Bottle Up And Explode!” There’s a funky edge to the song that sets it apart from the rest, with some interesting keyboard work that at times is similar to the sounds of the video game where Mario is in a castle level trying to get past those annoying flame pits that spit fireballs. “East” is the song that reminds me, at first, of Sunny Day Real Estate (yes, I am currently hugging clenched fists to my chest and dreamily looking toward the ceiling in a manner that doesn’t at all suit a thirty-year-old woman). It’s got just a little bit of that sad-grit thing going for it that Sunny Day Real Estate did oh-so-well. Underslept has the sound of a laid-back afternoon of light beers sipped while reclining on a warm green lawn on a Sunday. It’s simple and it’s mellow. The trouble is that I’m a complex and moody girl, in need of music that makes my brain flutter and my eyes mist with the remembrances of things past. I’m looking for Proust, and this is more like Hemingway. Good, but just not my style.